The new shawl I’m designing has a center panel that I want to come down to a point before adding the border. I think I’m going to try this doing short rows, but a quick swatch test showed me that wrap and turn short rows were going to be painful in lace weight yarn. 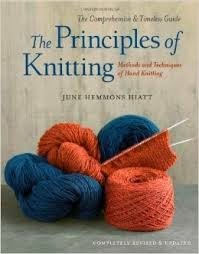 So off to my studio for the huge tome, The Principles of Knitting by June Hemmons Hiatt. If you’ve never seen this 700 page book (I have the revised edition), you really should track it down. Hiatt is the geeky-ist of geeks when it comes to knitting. She has five different techniques for creating short rows, plus variations on those techniques! You have to get used to some of the language in this book. When she wrote it in 1988, knitting wan’t as big as it is today. She uses some non-standard terms compared to those in popular use today. (For instance, she uses “inside” and “outside” instead of “right side” and “wrong side.”) However, this book has just about everything you ever wanted to know about anything having to do with knitting– and many ways to do it! 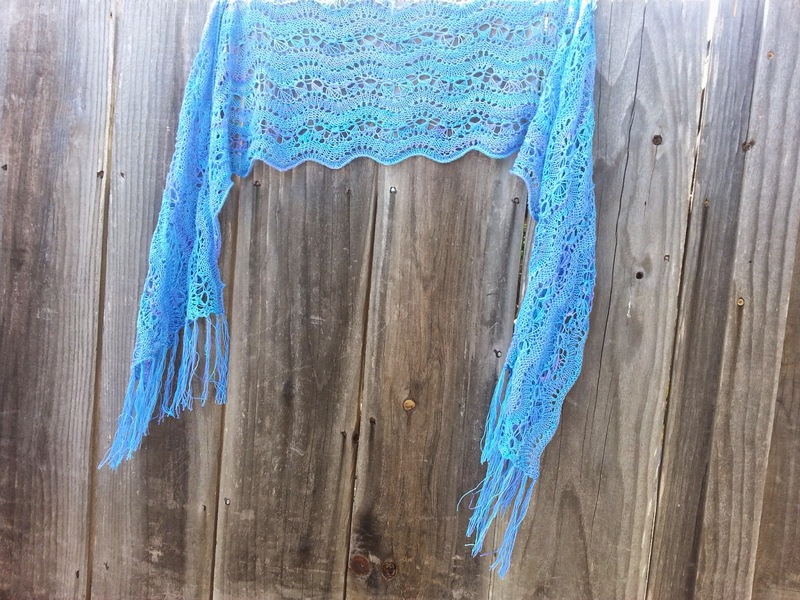 I finally finished the Ocean Waves shawl that I was designing and have uploaded the free pattern to Ravelry and to Craftsy. 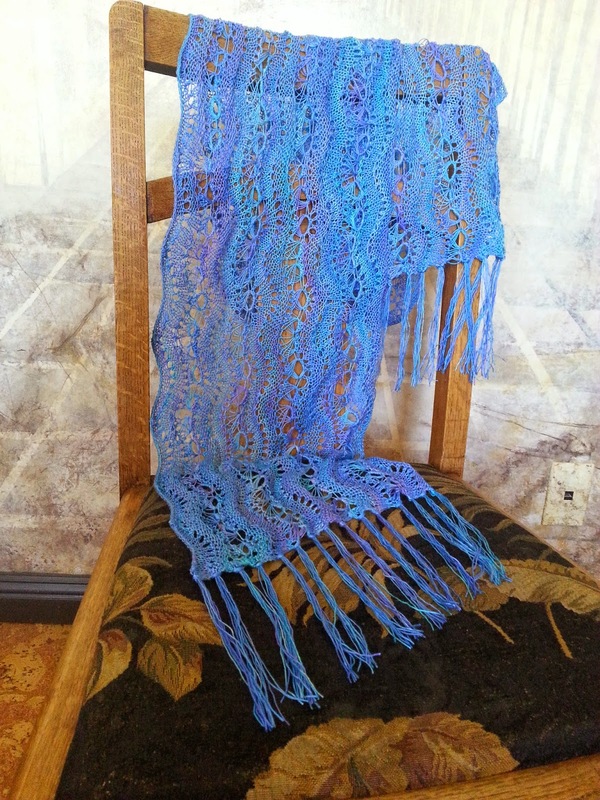 My goal was to make a fully reversible shawl design that showed off and worked with the color changes in hand dyed yarn and I think that I succeeded. The first problem was finding reversible stitch patterns that looked similar on both sides. I settled on a modified version of the Old Shale Lace pattern where an equal number of rows of knits or perls alternate with a the lacy row that gives the pattern it’s curves. That was kind of dull by itself so I then looked for a textured pattern that was also reversible. After looking through all my stitch dictionaries, a web search for reversible knitting patterns took me to the pattern for the Crown Stitch. I modified this pattern slightly so that it, too, looked the same on either side. and put them together. I originally thought I might add some small fish beads to accentuate the idea of an ocean, but they were ultimately too heavy and too large for the pattern. In designing the shawl, I knit until I ran out of yarn, so this pattern would work well for an unknown amount of yarn. There are two stopping places in the 34 row repeat. It could also be knit wider or narrower by adding or subtracting groups of 80 stitches from the cast on row. Why 80 stitches? The crown stitch takes groups of five stitches to complete and the waves of knits and perls are groups of 16 stitches plus 17 for the ends. Turns out the multiples of five that work for both come every 80 stitches. At some point I will knit at least some swatches of this pattern in different weights of yarn. I think that the pattern could be modified for a variety of uses– blanket, cushion, scarf, etc.